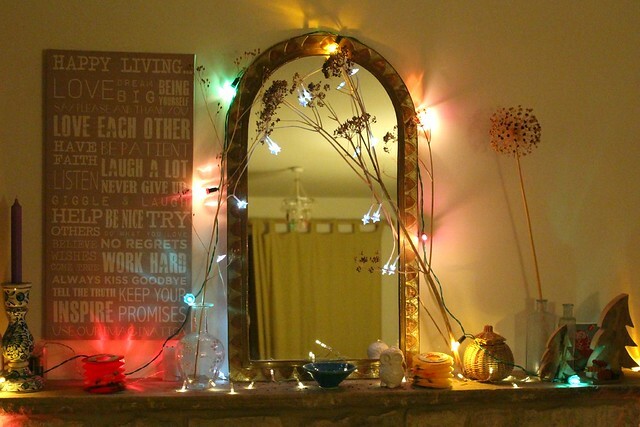 Oh yes, I still need my fairy lights for these dark winter nights. These vintage lights give a lovely soft glow, such a brilliant invention. They are quite old now, I love them. I have been doing my daily stretching on the mat here in front of them. Lets see, I am at day seven. I'm starting to feel a bit looser and have began to work through the initial stiffness that immediately appeared in several places! It tends to be in the evening. I'm remembering how it feels to stretch out and move in a certain way. For me movement is the answer. I need this. I know how important it is to stretch and rotate all the joints. Keep things moving. Stay supple. I just do it in my own way. A combination of things I have studied. I would call it more like a gentle stretching and movement meditation, with a bit of self Shiatsu thrown in for good measure. I really admire how in the Oriental culture gentle movement is practiced everyday. I love the fact that even the older people will go out into the parks and practice. They know how important it is. It is what everyone does. Our culture tends to just stop moving. I remember on a trip to Edinburgh watching a group of older Chinese people stop and go through their routine in the city park one morning. They just chose their own spot and started to gently move in a meditative way that would probably be known as Tai chi. I was quietly watching, in the distance. Once they had left I went and stood in that spot and thought how inspired I felt to move the way they did, how easy it looked. For me I would have felt self-conscious there, but for them it was a totally normal occurrence. I want to be able to stretch and move everyday. Of all the inspiring stories I have read from older people who are living interesting and happy lives, they all have in common the fact that they practice some kind of body movement. They have kept moving and practicing, as well as engaging and connecting with life! Please join me if you want to. You can make it up! See what stretches your body feels like doing. Give yourself some space and listen. Just move slowly and gently of course. This is such a timely post for me! I am really wanting to do some stretching, but have no clue where to start. I echo busybusybeejay's comment above mine. If you have any info you can pass along it would be greatly appreciated. I think you're right to see the correlation between movement and healthy ageing. I do lots of walking, and try to do a bit of weight training, but I think the stretching is every bit as important. I too am in need of some sort of gentle stretching, any suggestions would be appreciated.